Abstract: The great substantial art exhibition held on Persian Gardens at Tehran Museum of Contemporary Arts in 2004 and registration of Persian Gardens on the list of UNESCO World Heritage in 2011, make it opportune to refer to a vital significant point hidden from the eyes of researchers of the subject so far: Persian Garden is the manifestation of a wise-humanist process with its form and geometry naturally following this process. As the result, the garden finds a destiny shared with those who use it. Thus the wiser is the design of the fate and destiny of the garden, the more extensive will be its interaction with the users. 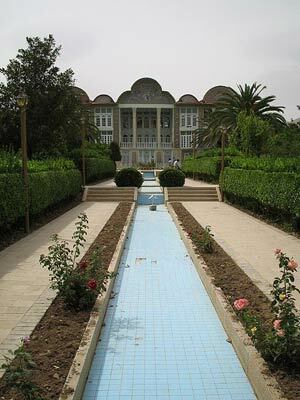 On entering a Persian Garden, the users will have all their senses, including their faculty of imagination aroused and inspired with the result that knowingly and unknowingly, consciously and unconsciously, the rhythm of their whole being will harmonize with that of the nature and in this way it is transformed, renewed and refreshed (frashkard). 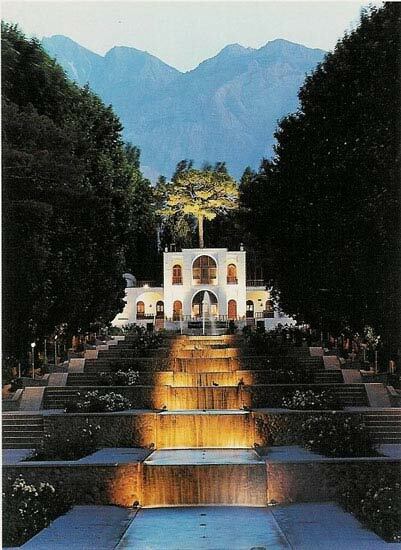 First of all, it is necessary to explore the meaning of the name ( Persian Garden , Paradise, Ferdos, a symbol of Eden ). 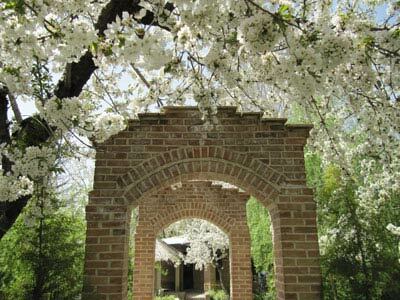 In recent eras, Persian garden is introduced and defined as an earthly symbol of the heavenly world. What has brought about such a surmise is the word Pardis, Paradise and Ferdos now known as Heaven, Eden. Meanwhile the very word paradaêza (=pairir-daêza) giving rise to all the subsequent heavenly allusions and inspirations is actually lost! In Dehkhoda dictionary under the entry Ferdos it is said: “Ferdos, the Arabic word of the Persian pardis is mentioned twice in Avesta as pairir-daêza consisting of the prefix pairir, meaning surrounding, environment; and daêza, meaning accumulation, piling, enclosing with walls. Writing about Manouchehr [Pishdadi], the son of Iraj, the son of Afridoun, Ibn Shadi Hamedani (c.590HG) (probably on the basis of Sassanid Khoda’ynameh-s [Epistles of Gods]) says: After the destruction of towns and the land of Iran, all in the city of Ray, by Afrasiayb [Tourani], Manouchehr began to rebuild everything from the scrap because of the scale of demolition, and called it Ma’hjaan (Ma’dga’n), Ma’hma’n (Ma’dma’n) and designated that ruined place, Supreme Ray... Manouchehr then collected various blossoms, flowers and herbs from the mountains and fields and planted them there, ordering to build a wall around that cultivated land. The important point here is that the garden should not be confused with the name defining it, even though there is always a relationship between them. The garden we are speaking about here has most of the things necessary for its emergence, while the garden which actually exists, carries little of its story. This is a very subtle and vital point. When we talk about the wisdom manifested in the garden, we use the magic of words to provoke feeling; while the existing garden should in itself leave an impression by virtue of its complex, which it may sometimes fail to achieve. Herodotus says: No nation can learn foreign rites, ceremonies and traditions as fast as Persians!” The fragile vase of Persian Garden lies in this very point, in the sense that by virtue of this inborn trait or talent, we can ignore and abandon our own ways and insights and instead follow the foot-traces of others. The point is that if we do not tend this fragile vase of Persian garden, it will be replaced by something with no name and history. 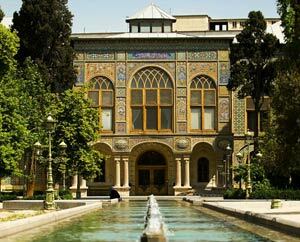 In other words, we should approach Persian Gardens directly and not merely through Orientalists, because if we discover and follow our own foot-traces here, we will definitely find the garden too. 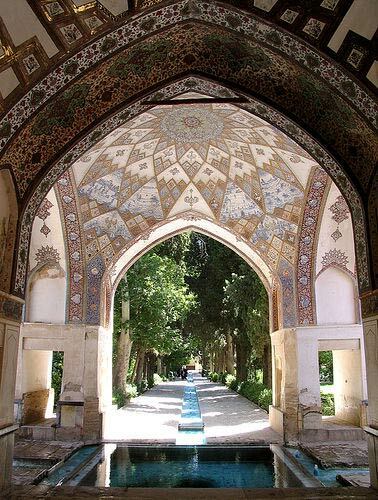 Like the palm of the hand, Persian Garden is engraved with lines from its past; a past which is found in its every corner, passageway, brook, canopy of trees, bushes, scents and most of all, in people and their relationships. The characteristic behaviour of each tree or bush, their geographic and climatic features and a distinctively holistic approach to them, together with symmetry of the garden which implies physical balance rather than tackling the question of irrigation are what are taken into consideration. In fact, symmetry and balance is one of the most important Iranian beliefs in regard to cosmic order. (The creators of the gardens were wise and intelligent enough to manage the question of irrigation in the best ingenious ways, such as digging qanats (water management technology), invention of ga’vgard (literally meaning a cow going round a circle) carrying out the work of pumping water out of a well or qanat, etc. ), Symmetry alludes to a divine secret. In Avesta, yasna 30 (paragraphs 2, 3, 4) it is said: It is the human mind which appraises and evaluates good and evil, beauty and ugliness, abundance and lack, otherwise they do not exist on their own. Zoroaster says that these two primal forces born out of human mind are ‘twins’, with each carrying out its own function alone. Though related, they do not follow each other. They manifest themselves in thoughts, words and deeds, which means that they do not have an independent existence, except in the human mind. These forces are free in their action. Ultimately, Zoroaster says: “Choosing Good is the work of wise people.” Good and evil are among the qualities of matter and their validity depends on the mind. Moderation is the way of the righteous virtuous people. At the first glance, on entering a Persian garden, the user faces a kind of splendor, based on the worldview of its designer; a kind of splendor immensely praised in his/her sacred scriptures which leads to a heart-filling praise even if it is not uttered. As one continues to walk through the garden and faces all its carefully chosen components, the above state of appreciation and gratitude develops into a higher state resembling to that experienced during what is called a ‘spiritual journey’. In short, through this promenade, one is overwhelmed by a state of humbleness and gratitude which usually happens in a temple. 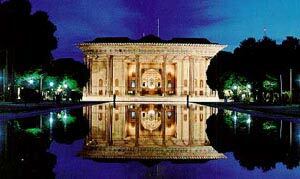 It is the meaning hidden in all this praises that elevates the Persian Garden to the position of a temple. 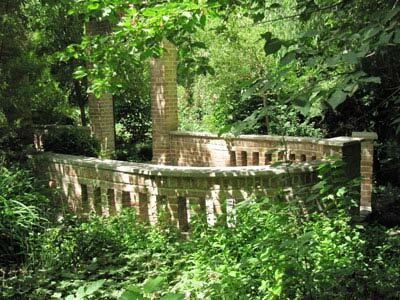 The same sensual emotional state and the foot-trace of this vegetation song (that is the garden), which is the twin of sacred hymns, is also found in its noble ancient musical pair (Barbad’s musical pieces) such as pieces called Siyavasha’n Garden, Shahriar Garden and Shirin Garden. The secret of Persian Garden lies in the fall of the eyes on its components which like the notes of a splendid piece of music follow each other, without the possibility of changing a single note. These components include, an empty-full majestic threshold as an entrance, the axis of the view (imparting the feeling of security and balance to the user at the first glance), limiting what the eyes see with the foliage and flora, and finally, conveying the cosmic order in a way which depends on the designer’s view and approach implied either by the architectural order or the order of moving around. In fact, secrets hidden in the past events will not be discovered unless deeply sensed. Persian Garden is the process of interaction of favorable and unfavorable geographic-climatic conditions with Iranian people, or better to say, it is a bed of real ecological structures with the foot-print of a wise rational thinking mind! By enclosing one’s own thoughts (paradaêza of mental waves) in a piece of walled land for particular uses such as recreation, performance of religious ceremonial rites, a place for growing and supplying crops, herbal medicine, fodder, dyes and many other needs, one shows one’s personal conception of Nature. Giving the name of particular trees to the gardens grants a mysterious quality even to their pronunciation. Defining vast expanses with familiar distant names such as ana’resta’n (garden of pomegranates), moesta’n or ta’kesta’n (garden of grapes), and so on, bestows a mysterious fabulous tone to them. The use of sacred numbers also plays a vital role in their division. The hidden sensual-emotional basis of Persian Garden embodies special concepts: here creates peace, there evokes imagination and thought, at another corner the feeling of pride is fulfilled, at another the feeling of splendor and mastery, here sacredness and salvation is experienced and... in one word, each corners is filled with its own mystery. 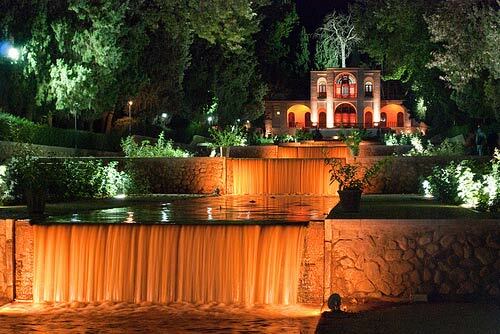 The nights of Persian Gardens have also their own tale and considering the role of the moon and its influence on the earth and its inhabitants including human beings, it occupies an important place in the design of Persian Gardens , with Mahta’bi as an architectural example of it. Literally meaning moonlit, Mahta’bi is a ceiling-less room built on a low platform, with three beautifully constructed and decorated walls, surrounded by flowerbeds with flowers emanating their scents especially at nights. Its geographical location in the plan of the garden was determined according to the geographical direction of the moonlight. 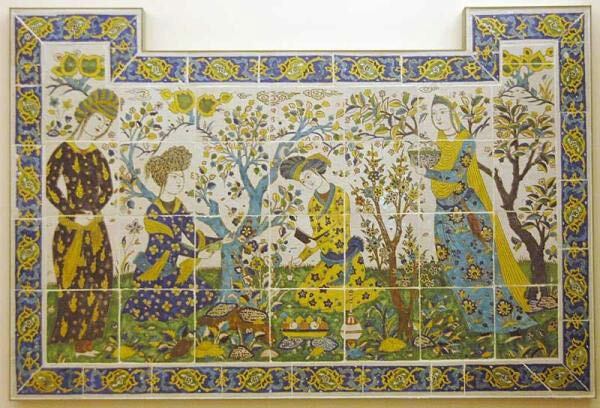 Iranian designers and gardeners made use of all the qualities of night and with their knowledge of astrology, they calculated the best time for cultivation of various crops. They could even predict droughts (through comets) by looking at the night sky, and contemplate on their plantations and crops accordingly. All this are excuses for artistic creations in a Persian Garden with trees and flora, some of which mentioned in various texts. In Fars-na’meh (The Epistle of Fars), it is said, fruits of both tropics and cold regions are all found there (i.e. in Fars), walnut, pomegranate, fig, date, na’renj (sour orange) and toranj (begamot), lemon, and other citrus trees are found in every garden. This vast collection of fruits of cold and tropical regions is not found anywhere else. In Pourda’voud’s Hormozd-nameh (The Epistle of Hormozd), it is said about alfalfa, called Madi plant under Achaemenids, that it can be harvested six times a year and the seeds can last up to thirty years. Theophrastus says: Persian apple or toranj (begamot) has both good smelling leaves and fruit. It has flowers throughout the year. The ripe and unripe fruit are found hanging next to each other. Polonius says about the same tree: Any tree separated from its native land should be planted in a smaller place in order to bear fruit, but this tree refuses to grow in any place other than its motherland. In Ferdos-al-hekama there is a tale about a king who enraged by a man, he sends him to prison. Before that however, the king asks the man, what do you want as your sole food? The man chose toranj. He made flour out of its fruit proper once dried; and baked bread with it. His vinegar was its sour juice and from its seeds he extracted his cooking oil, from its peels and leaves, he made perfume. That’s how he survived and thrived. Sa’a’labi Neyshabouri says: Gor is one of the villages of Fars , famous for its red roses having such a divine scent not found in any other places. Rose water of Gor is also divine. Twenty seven thousand bottles of it, together with other things are sent to the Caliphates as tax each ear. Herodotus points out: Iranians are always in search of light and fresh air! However, we are living in an era, when the beauties of the past have lost their power to the new ugliness. That’s why some parks and gardens give us peace and relief in our struggle against ugliness and disharmony. It is by virtue of these facts that the same phrase: “One was and one was not...” (equivalent of “Once upon a time” in English) marking the beginning of a Persian story, can also begin the story of Persian Garden . It is in this “‘was’ and ‘was not’” that the user searches for a balance between material and spiritual elements and depending on his/her power of imagination which will automatically lead him/her, he/she will intuitively reach a vital imperative, the existence of the Cosmic and Natural Order, bringing about refreshment, renewal, resurrection (frashkard). To conclude: “You knowledge, the most righteous creation of holy Mazda: If you are ahead of me, wait for me, and if you are behind me, catch up with me!” (Zardosht). About the author: Khoobchehr Keshavarsi is an architect and researcher from a Zoroastrian family. (1) Bahman is the name of Ahuramazada’s first created Amshaspand (archangel), symbolizing good thoughts, words and deeds.